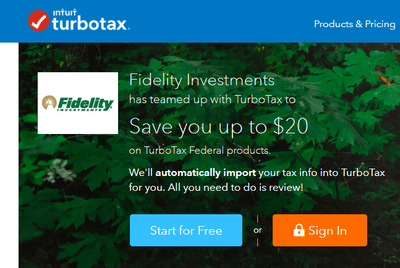 You can get $20 when you use TurboTax to prepare your tax return when you go through Fidelity.com ( it applies for both Fidelity customer and non Fidelity customers). Basically you have to go to Turbotax via Fidelity.com or you can use the below link to get this discount. Previous post: How do I get 5% Back on ALL Amazon Purchases?